Tributes from former US presidents and across the political spectrum have poured in for Republican Senator John McCain, who has died aged 81. 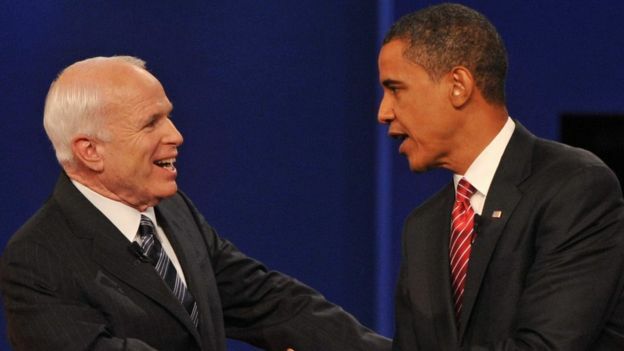 Barack Obama, who beat Mr McCain to the White House in 2008, said they shared a “fidelity to something higher”. George W Bush described him as “a patriot of the highest order”. President Donald Trump, whom Mr McCain had strongly criticised, tweeted his “deepest sympathies” to Mr McCain’s family but did not comment on his life. Sources quoted by US media said Mr Trump would not be invited to the funeral and the current administration would probably be represented by Vice President Mike Pence. Former Presidents Obama and George W Bush are expected to give eulogies. Mr McCain was diagnosed with an aggressive brain tumour in July last year and had been undergoing treatment. But on Friday his family announced he had decided to discontinue that treatment. A statement from his office on Saturday said Mr McCain died in Arizona surrounded by family members. “He was a public servant in the finest traditions of our country. And to me, he was a friend whom I’ll deeply miss,” Mr Bush said. Mr Obama said that despite being his Democratic rival, they shared the ideals “for which generations of Americans and immigrants alike have fought, marched and sacrificed”. Sarah Palin, who was Mr McCain’s running mate during his 2008 presidential bid, said the world had lost “an American original”. Canadian Prime Minister Justin Trudeau said Mr McCain’s lifetime of public service had been “an inspiration to millions”. 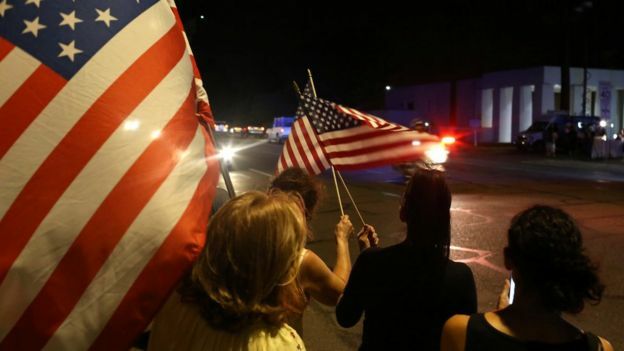 Following news of his death, wellwishers waving flags lined the street as a hearse brought Mr McCain’s body from his ranch in Sedona, Arizona, to a funeral home in Phoenix. While being held by his captors, he suffered torture that left him with lasting disabilities. In politics, he took a conservative line on many issues, including opposing abortion and advocating higher defence spending. He backed the 2003 invasion of Iraq and criticised President Obama for not intervening more in the Syrian civil war. In July last year, just after his diagnosis, he took part in a late-night Senate session and gave the deciding vote – with a thumbs-down gesture – against partially repealing the contentious Obamacare healthcare law. The move reportedly infuriated Mr Trump. Mr McCain also criticised President Trump’s hard-line rhetoric on illegal immigration and his attacks on the media. John McCain was born shortly before World War II, at the dawn of the “American Century” – a time when the US was at the peak of its political, military and cultural power. He dies at what could be considered that age’s twilight, as the nation turns inward and contemplates walls, literal and metaphorical, to insulate itself from the rest of this world. In his first run for president in 2000, he capitalised on an anti-establishment sentiment and longing for authenticity that would later come to crest with Donald Trump’s election. In 2008, he won the Republican nomination, only to see his hopes dashed by the phenomenon that was Barack Obama and a crumbling US economy. It’s an open question as to whether these views have a future in his party. McCain, however, fought for what he believed was right until the very end. Agree with him or not, that is undeniably a most appropriate epitaph.